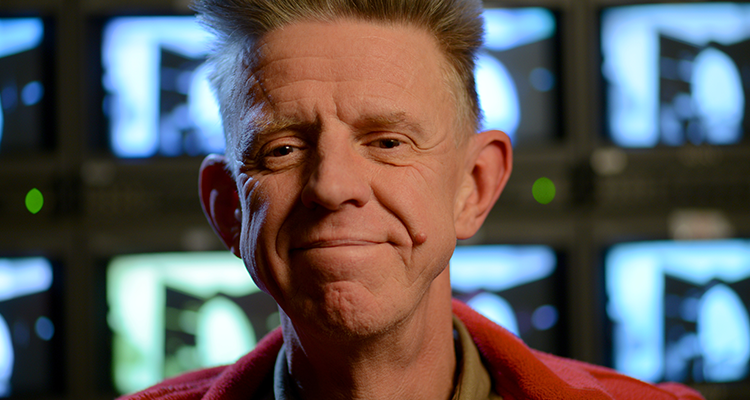 Acclaimed British film maker Alex Cox has just released a new book entitled Alex Cox: Introduction to Film. This action packed book defies convention, just like its maverick author, who discusses at length the intricacies of genre, camera angles and production values. Learning the rudiments of film making at UCLA, Los Angeles, in 1977, Alex has created some of the most innovative and iconic British masterpieces of the eighties and nineties, and is responsible for cult hits including Repo Man (1984), Sid and Nancy (1986) and Walker (1987). His work as an independent film producer still packs a powerful punch thirty years later, but I wondered if Alex was the person to reassert his views on film studies from ‘the other side of the fence’. Many studying Film and Media at Birkbeck may question if they have all the tools to equip themselves throughout their studies. However, the Birkbeck community is lucky to have outstanding teaching across The Department of Film and Media, as well as amazing film institutes around Bloomsbury including the Birkbeck Institute of The Moving Image at 43, Gordon Square and Bertha Doc House in the Brunswick Centre. After a successful stint teaching film studies as a lecturer, teaching production and screenwriting at The University of Colorado in Boulder, Alex Cox set to work writing his new book. I sat down with Alex alongside fellow film maker and Birkbeck Film and Media undergraduate Jacob Watkinson for a full and frank discussion on the reasons behind such a bold project. Is there too much theory in film studies? I feel within academia there is a tendency to obfuscate and use impenetrable language. The general public don’t talk like this. They find it difficult, and the student more so. Does this then discourage students? It should. What I have found is that students start to use these terms. The first time I heard ‘diegetic music’ was when I first taught at The University of Colorado. When I first heard that I didn’t know what the student meant. Then I realised he meant ‘source music.’ I felt this was an issue. So the book is correcting the vocabulary of the student? Nobody working on a film knows what ‘diegetic’ means. If you are in academia then of course you know, and the book is correcting that. Source music makes sense to the film people, and diegetic music to the academic. You don’t mention in the book of crossing the line, the 180 degree rule, the shot reverse shot – is that because it’s instinctive? That’s interesting, isn’t it? Crossing the line is rare. Sometimes it occurs, but it jumps out at you. Either the Director or the Cinematographer notices it. In my last film, Bill the Galactic Hero (2014) we realised we had crossed the line, but normally you would do it. Shot reverse shot is instinct. A person looks to the right of the camera, another person to the left. It’s engrained in you, there’s no need to discuss it further. I found it refreshing that often in academic circles, the director is the star of the show. But you didn’t choose to portray the director as one. In a way the director should be the star of the show. It’s like a christmas tree light. The tree is covered in beautiful baubles without which it wouldn’t be a christmas tree. There is only ever one fairy on top of that tree. I think that should be the director. But if you think about auteur theory and who is the auteur, the example I give you is The Wizard of Oz. It’s not one single director that is the auteur. It has five or six directors. They kept getting replaced. Gone With The Wind had the same problem. It had multiple directors, but nobody could be considered the true auteur of the film. They took Victor Fleming off The Wizard of Oz and put him on Gone With The Wind. He did direct the bulk of the film. I would probably say the auteur was David O Selznick, who produced it. It would be seen at the end of the project, and so it’s his film. It becomes interesting when you compare the work of legendary directors such as Hitchcock and Selznick. Yes, it is interesting. You have two powerful film makers and creators going head to head from different cultures. This caused problems, and it challenges the standard theory of film history. I wanted to speak honestly about this problem. You have the book broken down into making a film, with chapters on things such as productions and scripts. This is very different from the standard analytics of, say, mise-en-scene. Is this essential for modern film makers? You need to know all the functions, whether you are a film maker or a critic. I don’t know what a best boy does – what do they do? They use a grip and push things around. It is important to know what they do, and who they are responsible for. The book suggests that film making is a team game. Is this essential and relevant to both film makers and critics? You claw your way to the top of the tree, and then you have to give it up. This is because you can’t do everything, even though some feel you can and are taught so. Director Robert Rodriguez wrote a book about it called Rebel without a crew. Did you think it was ridiculous to think he did it all by himself? It is a collective act, formed of many people. He had a crew, and a big one at that; from the stunt men to the visual effects guys that worked on the picture. Isn’t this like you suggest ‘the hubris of the director’? The directors (and auteurs) of the nineties, were guilty of this. Yeah, but even Stanley Kubrick was very guilty of this. He was an auteur director, but someone lent me Doctor Strangelove and Terry Southern’s name was tippexed out as a writer. Removed. Who would have done that? Stanley Kubrick of course. Sometimes directors have to have more. I suggest that sometimes it is driven into you. Do you feel that your book is setting out to stop young film makers becoming an auteur? It’s interesting because out of all the film schools I have been involved in, there wasn’t the problem as to who was the writer or director of the film. You get one to write the film, and the other one to direct the script. Maybe they could get someone from the business school but on the whole that doesn’t happen. I didn’t see it happen in the US but it may happen here. Formerly an economist with a love of film, Simon has now set out to become a documentary film maker. Through his endeavours he has created a new series of the cult TV programme Moviedrome (now in production with its original company, and set to be turned into a television series with Mark Kermode as presenter). Simon is currently working on a documentary about Moviedrome, and following that will move onto two projects, the first looking at LGBT rights in Uganda, and the second, game theory and the film noir.